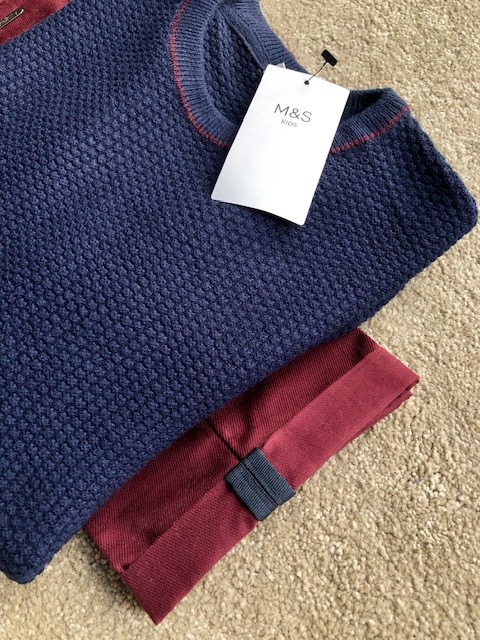 For my regular collaboration with Marks & Spencer, I'm featuring kids clothes - for a change. Though as you know, it won't feature my actual kids...just flat lays. I know you understand this - I've pretty strong views on kids on blogs and most brands are not interested in working with me for this reason. But M&S don't have an issue with it and I greatly appreciate that they respect my views. 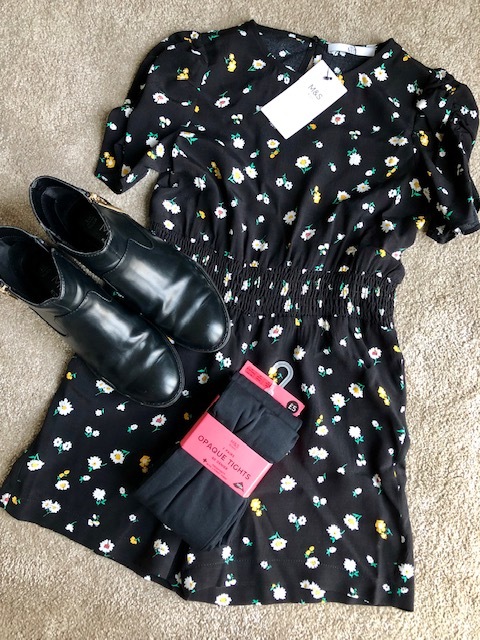 Starting with the almost 15 year old and any of you who have kids this age will appreciate the difficulty dressing them. So I was amazed that he found an outfit that he loved (and has worn twice already). The chinos are a good slim leg fit and he's wearing Age 14-15. He's teaming them with a navy moss stitch knit which he got an age 12-13 in as it was quite oversized in the bigger size. There's lovely detail on both - particularly like the navy trim on the turn ups of the chinos. 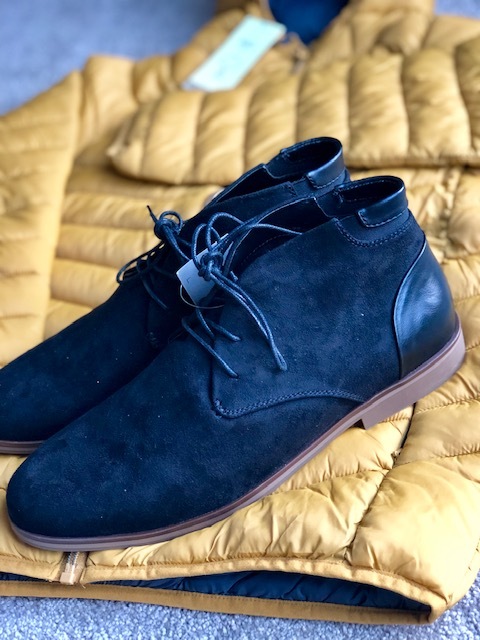 Shoes wise, he had to go to the men's section...frustrating as men's shoes are generally more expensive but these suede boots are just £35. 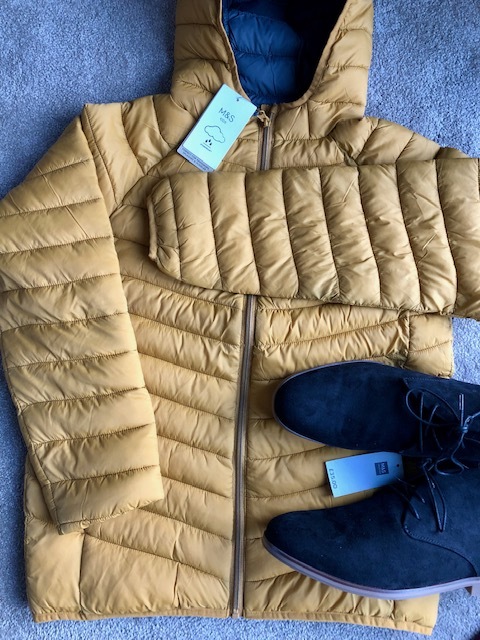 He also put some of his own money towards this yellow puffa style jacket as he loved it. It's an age 14-15. 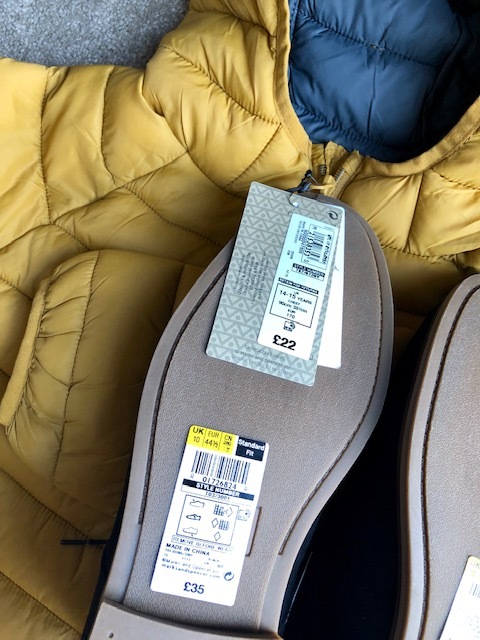 It's mind boggling to see him order a coat in age 14 and men's shoes in a size 10!!! Next up the twins did what twins do so well - pick something COMPLETELY different to each other! 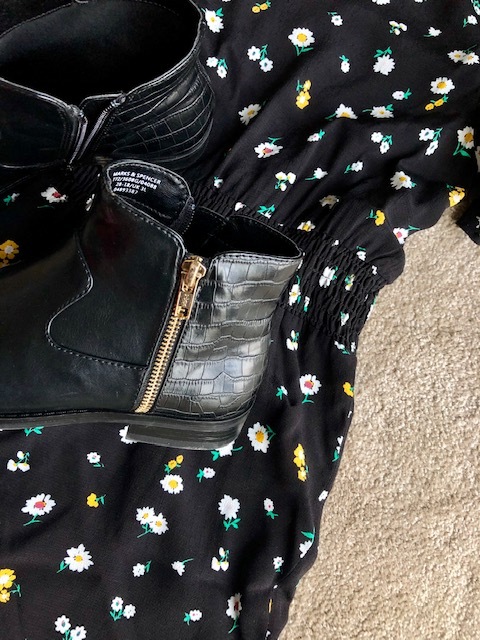 The older girl chose this black floral playsuit. She will usually only wear black leggings for me so this was a welcome departure. She added 60D opaque tights and some black ankle boots with a zip and croc effect detail. Size wise, the playsuit comes up small so definitely size up - I got her the 10-11. She's tall but slight and needs every bit of it and she's one just turned 10. 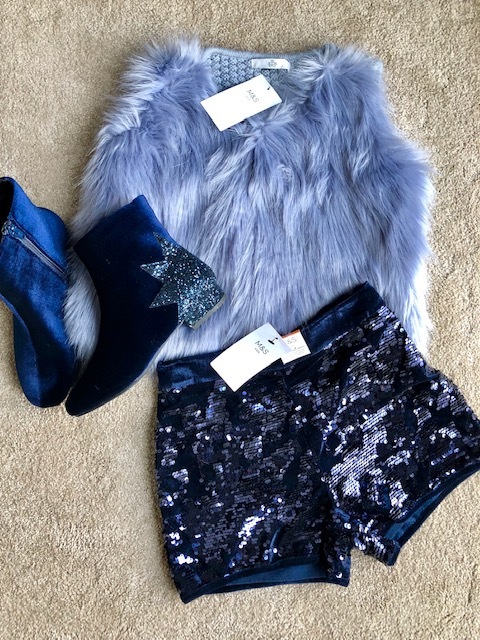 My other daughter is a real texture girl - she loves fur, sequins and velvet and this outfit combines all three! 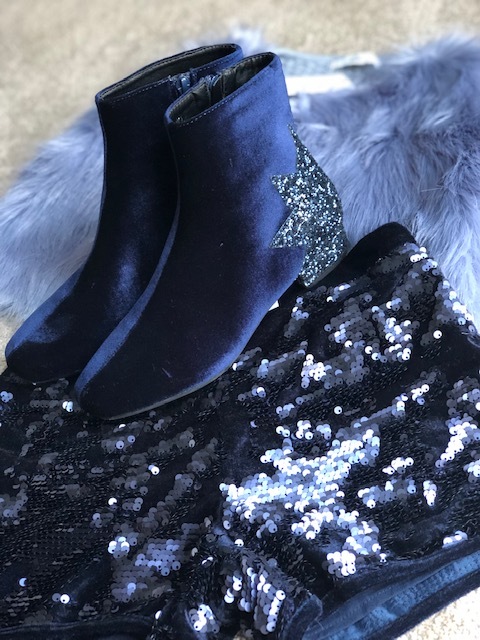 The boots are particularly lovely with their glitter heel...so perfect for Christmas! 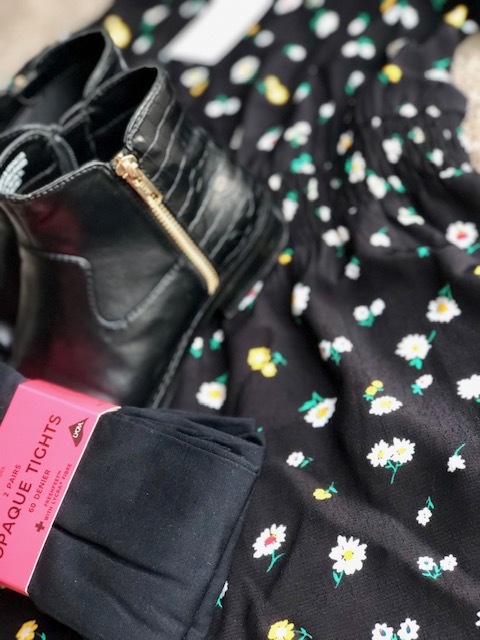 I bought her sequin shorts last year too and she wore them endlessly - daytime or springtime, she's always happy to have a bit of sparkle. 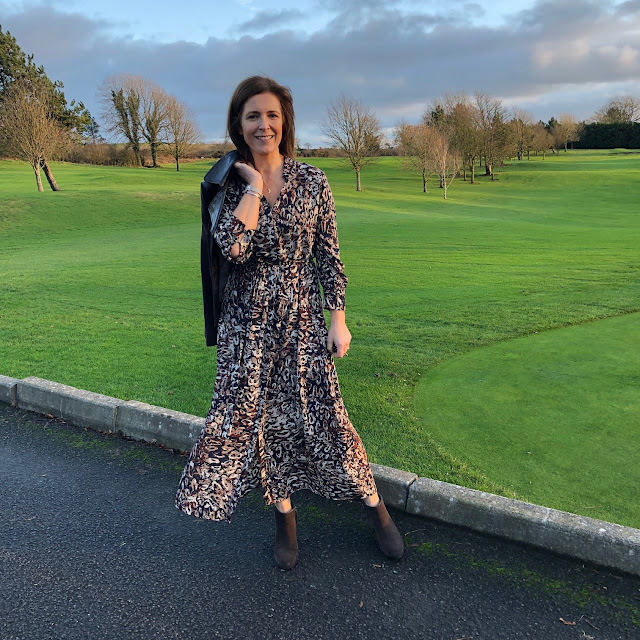 Not wanting to be left out and I should say, at my own cost, I added this dress to the order - which I've already worn to a Christmas lunch with my Field Day friends. It's a perfect buffet dress (see Susie's post here for an explanation of that!) and the lovely mix of colours make it so wearable. I also love that it's not leopard but it's got that animal vibe going on. I've not been on here much over the past month - a combination of Christmas approaching and work means I've had less time to blog. But I'll be back in the swing of it again in the New Year as I've got more regular hours in work and fewer parties/events to go to. The job is still going well though my project is likely to come to an end in January. I'm not sure if I'll be kept on but hopefully they will find another project to keep me busy! I'm hosting Christmas this year and I can't lie - I'm a bit anxious. I know I have no need to be but I can't help it. I've a tendency to forget things and I'm making lists galore to ensure I've everything here for the 12 people I'm feeding on Tuesday. If you're also cooking for many this Christmas Day, I will gladly take all the hints and tips you have! I guess all that's left for me to say is a massive THANK YOU for reading, watching, following and commenting. I know not as many people read the actual blog anymore but I won't ever let it go - there are still many thousands of you here every week and I appreciate you dropping by. I've always struggled with Instagram and the competition that you face on there, both from the millions of other accounts vying for your attention and the feeling that you might not be quite achieving & succeeding as well as others. So this space will remain - no pressure and hopefully a place where you find inspiration and an escape from day to day. 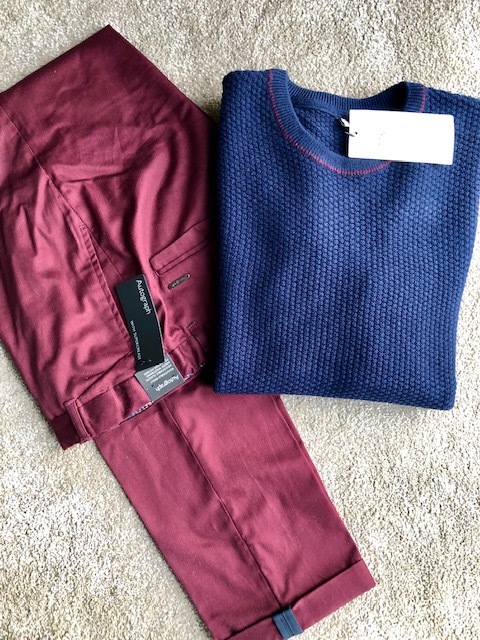 Disclaimer - I was not paid to write this post but was supplied with vouchers to purchase some (but not all) of what I've featured. My links are affiliate links which means M&S know you came to their website from my blog and they may pay me a tiny commission if you purchase and keep anything after you click the links. This doesn't change the price of the item for you and the modest income I make from these links helps to cover some of the costs of this website - so thank you! I love your blog and IG Avril, you are one of the most genuine bloggers I know and I admire your integrity and honesty. I know your posts are always genuine and you don't post about any products you wouldn't buy or personally endorse. I am also cooking for 12 this year, my one tip I got from IG was to buy a large piece of MDF to extend our dining table !!! Take care and I wish you and the family a Happy and Healthy 2019 ! God Bless . Hello, I'm new to your blog and am really enjoying it. Your style and colouring is very close to mine, thank you for the inspiration you've already provided! Love your blog! We have a Christmas spread sheet that we use when catering for large numbers, it includes timings etc so that nothing gets forgotten - not been allowed to forget the year that I left the bread sauce in the fridge! Dear Avril, Thank you for being there...life would be a lot less brighter without you!